At Abilene Family Dentistry, few things make us happier than hearing we’ve made visiting the dentist less stressful and more pleasant for our patients than they could have imagined. We’d love to take all the credit, but often what helps make appointments go smoothly is advanced technology. We’re committed to furthering our education and implementing the latest and greatest ways to elevate your oral health and enhance your smile’s beauty. From clear visuals that help us catch abnormalities or see what a great job you’ve done brushing and flossing to cosmetic and restorative treatments that need precise details to form, our practice has you covered. Stop By and Check Our Tech! We use a CBCT (Cone Beam Computed Tomography) Scanner to take digital impressions of your teeth. This means we don’t need to fill your mouth with a goopy alginate to craft restorations, map out dental implant placement, give you precise clear aligners, or create custom-fitted mouthguards or nightguards. We can collect images quickly and easily, then convert them into digital models for accurate, comfortable treatment planning. Having a CEREC Milling Machine in our practice saves you from having to make multiple trips to our office for restorations like dental crowns. With our 3D imaging technology and CEREC, instead of having to take messy impressions and send them off for the fabrication of your restoration while you wear a temporary, we can create a durable, beautiful, precise-fitting crown to get you back to smiling confidently in just one visit! We love digital x-rays because they’re safer for both you and our staff. They use up to 90% less radiation than traditional x-rays while showing us more accurate images, which helps us to better detect disease and decay in their early stages. 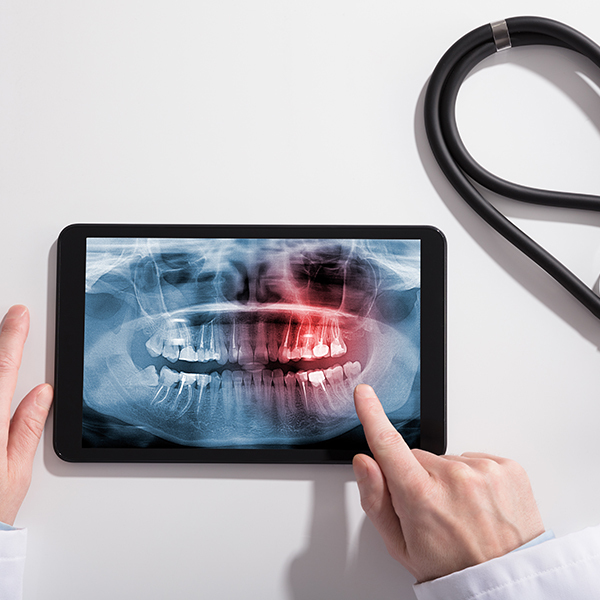 Digital x-rays can be taken in a matter of seconds right from the dental chair, and then viewed almost instantly on the screen so that we can show you what we see. Intraoral cameras are a massive step-up from our eyesight and a tiny dental mirror alone. They allow us to see high-resolution images that can be magnified for earlier detection of disease and decay. With a wand about the size of a pen, we snap images that we’ll store in your file for comparison at your future appointments. This helps us catch anything that’s abnormal for you, and shows us any areas that could use improvement when you conduct your oral hygiene routines. It’s difficult for us to choose our favorite piece of technology, but our CO2 laser has to be top three. It’s incredibly versatile with applications that keep expanding. Our CO2 laser helps us perform virtually painless, gingivitis-killing deep cleanings, frenulectomies, and crown lengthening treatments—all without the need for a scalpel and sutures. Dental laser procedures are minimally invasive, more comfortable, and offer faster healing times and more beautiful results. We happily carry and offer CariFree products in our office because they’re clinically-proven to help patients fight the root cause of tooth decay. If you’ve experienced dental caries despite keeping up on your oral hygiene routine, we highly recommend using CariFree. By balancing the bacterial levels of your mouth, CariFree fights the acidity that attacks your enamel and dentin.